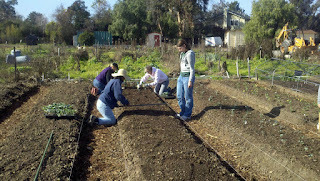 On 16 January 2011, Judy, Peg, Ruth, Jennifer, Miki, Maya, John, and Mark planted out some of the starts seeded on 15 Dec 10 (starts were about one month old). All beds used, except B2, were top-dressed with manure blend. In bed B2, fava beans were snapped off at ground level before planting Goliath broccoli with 2+3 spacing, rows 15 inches apart. Fava beans were added to compost area. On bed A6, Vates Blue Curled kale was planted with 3+4 spacing, rows 12 inches apart. On the W end of bed A6 some Red Russian and Lacinato kale was also planted. Beds AB7 & AB8 were planted with broccoli, same spacing as in bed B2. AB7 had Premium Crop on the W end, and Waltham 29 on the E end. AB8 had a few Goliath on the W end, then some Premium Crop in the middle, and Waltham 29 on the E end. Extra Waltham 29 broccoli (a few plants) were stuck into bed B4, and extra kales were placed in B4 and B5. Peg and Maya pulled the old broccoli from bed A2 and placed them near the compost bins. Ruth, Maya and Miki pulled a lot of chickweed from adjacent areas, which was added to the compost.